The war with China is continuing and peoples have been forced to cooperate to military posture. Almost all of News that the Children News which hanako is in charge of broadcasts are the ones related to military. K: Miyamoto Ryuichi-san is here? K: Miyamoto Ryuichi-san, We'd like to confirm you about peace overture. Please come together to the provost guard office. N: What, what are you going to do? K: What are you doing? Why don't think of Renko and your children? You have ones who you should protect! Ry: This country is getting crazy. Without stopping it, I can't protect my wife and children! R: Hana-chan, What are you really thinking about? In front of the mike of radio, where the Japanese troops attacked and so on, innocent children will be influenced with such news. H: I don't want to tell the news of war too, but that's why I want to light the spirits of children. R: It's hypocrisy! I don't prostrate myself to the wave of ear. I don't want to be alive dirty like you. In September of this year, the invasion to Poland by Germany set off the Allies declared hostilities against Germany, then the World War II began. 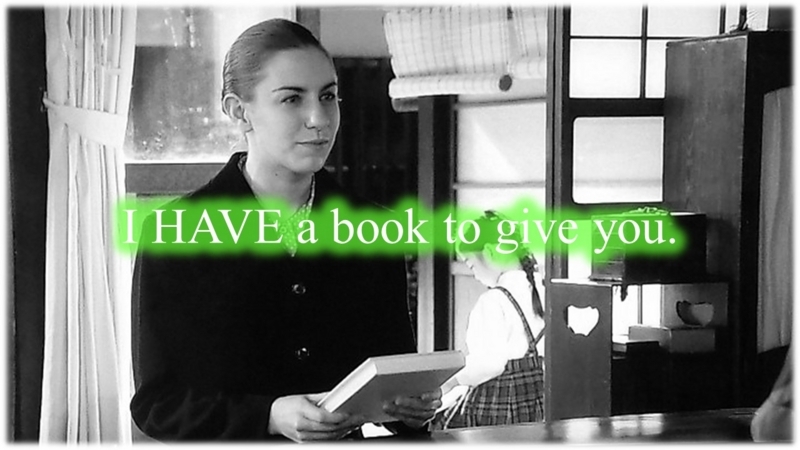 S: I have a book to give you. It graphically draws stories that Anne Shirley, she has red hair like carrot, is going to relate to peoples. Hanako hopes the day when she can publish the book Miss Scott gave her comes. H: Hello, this is Muraoka. Kr: I'm afraid you have to take a day off today. Ridio: We have a special news. Imperial Japanese navy pressed ahead with air strike U.S. fleet and air forces of Hawaii region, and carried out vast air raids on Singapore and others too. H: I'm going to JOAK though. S: Everyone in the country, get together in front of the radio. We don't have to afraid of the enemy as cattle even if it were great. H: Urushibara-bucho, as of today, I quit the job for Children News. H: I can't tell children news of war. U: You can quit. After all, you are just the ma'am of Gokigenyo.